For me this soup is fantastic for either a large family like mine or you can turn down the volume on all of the accompaniments and just feed less...great summer or winter. This is an all rounder. Give it a whirl. Place garlic, oregano, coriander, chilli, onion, zest, cumin and EVOO into Thermomix bowl and chop 5 sec/speed 6. Add remaining ingredients except corn and accompaniments, adding the squeezed lime skins into Thermomix bowl as well. Remove lime skins and squeeze well using a slotted spoon. Add corn and cook 4 min/100°C/Reverse/speed soft. Serve with all accompaniments on the side. 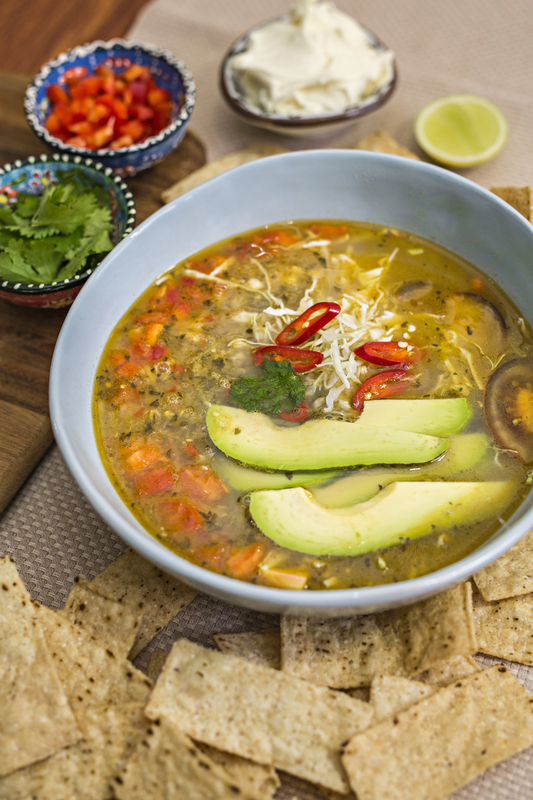 You can add as much salad and accompaniments to this soup as you like, it could feed an army! It is a delicious ‘summer’ style soup but equally great in winter. Enjoy.